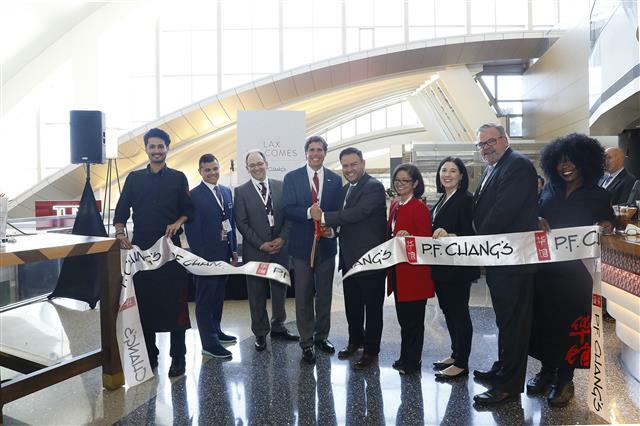 P F Chang’s has opened at Los Angeles International Airport’s (LAX) Tom Bradley International Terminal, offering passengers fresh Southeast Asian-inspired dining overlooking the Great Hall. The upscale casual restaurant maintains its focus on guest comfort, warm hospitality and attentive, personable service. The à la carte menu offers a variety of handcrafted signature dishes, all prepared using fresh ingredients. Most dishes at P F Chang’s are cooked in a Northern-style Chinese wok at 900°F, creating a ‘wok hay’ or ‘breath of wok’ and a mix of unique smoky, caramelized flavors and crispy textures that can only be achieved using this ancient technique. “At LAX, one of our four strategic goals is to deliver facilities and guest experiences that are exceptional, and our new P F Chang’s restaurant more than fits that bill,” said Barbara Yamamoto, chief experience officer, Los Angeles World Airports, which operates LAX. “We’re excited to bring P F Chang’s to the LAX airport,” added Genaro Perez, vice president of marketing, global brand development, for P F Chang’s. “Our food is always made fresh from scratch every day at every P F Chang’s around the world, and we are proud to now offer this unique experience to travelers at the Tom Bradley Terminal through our partnership with Paradies Lagardère.